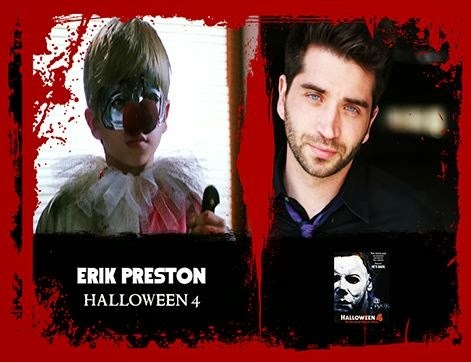 This week is the 25th anniversary of Halloween 4 and the 35th anniversary of the original 1978 Halloween, and we are celebrating both tonight with Part 3 of our interview with H4‘s young Michael Myers himself, Erik Preston (click here for Part 1 and here for Part 2), where we’ll wrap up our conversation with the actor’s thoughts on the John Carpenter classic that started it all. “I don’t think I remember the first time I saw Halloween,” Erik told us. “It’s like the first time you saw Star Wars. It’s such an iconic film that you’ve seen a million times. Do you really remember that (first time)? “Does it hold up today? I think so. As far as the horror generation of today that thrive off of more gore and less mental fright, I don’t know if it would hold up to them, but I hope it would, because it’s a great film. “It’s a phenomenal film. What John Carpenter did with that movie, the music, Dean Cundey with his cinematography, everything about that movie is phenomenal. Erik Preston is young Michael Myers in ‘Halloween 4’. Like we did with each of our “Halloween at 35″ interview subjects this year, we asked Erik if he has a favorite scene from the classic. “My favorite scene in the original Halloween,” he said, “I don’t know if could pinpoint just one because there’s so many. “I mean, when he stabs Bob up against the wall, or I love the part when she’s at the top of the stairs at the Lindsay Wallace house and the mask just comes out of nowhere in the darkness. You can see Erik in Halloween 4, returning to theaters starting today along with John Carpenter’s Halloween and Halloween 5, and you can meet the actor at the upcoming 35 Years of Terror Halloween anniversary convention happening November 15-17 in Pasadena, California. Click here for Part 1 and here for Part 2 of our interview with Erik Preston, and then click HERE for all of our “Halloween at 35″ interviews!